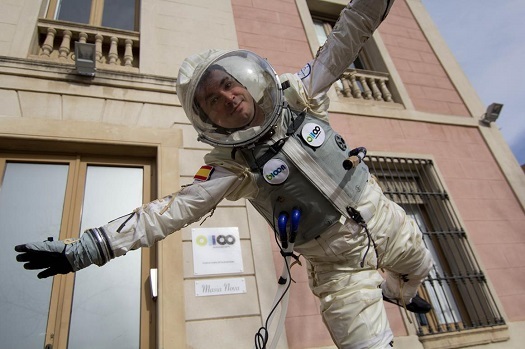 BARCELONA, Spain (zero2infinity PR) — The high-altitude balloon company zero2infinity, based in Barcelona, has received its first Space suit, designed by American company Final Frontier Design. This brings the company one step closer to crewed test flights, which should start later this year. Nick Moiseev, who led the design of the suit at Final Frontier Design (FFD), used to be a space suit designer for Zvezda, Russia’s national space suit supplier. He was responsible for designing the suits for the Buran and those worn by cosmonauts on Mir and on the International Space Station. After participating in the NASA glove design competition together with Ted Southern, they created FFD in New York, to become the main suppliers of comfortable Space suits for the commercial Space industry. zero2infinity is planning to use Space suits only during its crewed test program, to qualify the pod and its life support system. Suits are important in the initial phase for safety purposes to protect the pilots in case of depressurization of the cabin. In the long run, on bloon, zero2infinity’s commercial vehicle currently under development, passengers will not be required to wear pressurized suits. The company is currently operational to send scientific and technical payloads to Near-Space as was demonstrated during several test flights conducted in 2012 and 2013 (videos available here: zero2infinity on vimeo). Its aim is to offer the view from Near-Space to private passengers. Great decision by Zero2Infinity, the suit looks great!